Properly disposing of garden waste can be a big task for homeowners. Ricky Tyler Landscapes offers customers a complete green waste and compost service in Hertfordshire. We can collect your garden waste and dispose of it in an environmentally friendly way. We can also provide compost and other ground cover products, delivered directly to your home. Green waste is the term for any biodegradable waste from your garden. This can include grass cuttings, plants, and tree branches. While some types of garden waste can be included in regular council rubbish collections, many cannot. A green waste service such as ours collects all types of green waste, saving you a trip to the recycling centre. Our green waste and compost service can also be combined with a delivery of landscaping materials. These include ornamental bark, woodchip, mulch, top soil, sand, and ballast. These can help your garden look its best without harming the environment. Our eco-friendly green waste service will recycle or compost your green waste. This ensures that your waste is being handled properly and responsibly at all times. We can also remove green waste as part of our regular landscaping or maintenance services, saving you the trouble of disposing of it yourself. 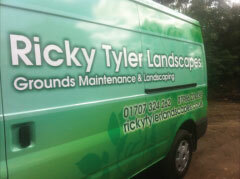 Why use Ricky Tyler Landscapes? Whether you are mowing your lawn, doing some seasonal pruning, or removing a tree, you will have green waste that might not be collected in council waste collections. Unlike some other companies, we will collect your green waste whether you have a single small bag or a full trailer load. This means that you can call on us for every job, saving you time and hassle. As part of our full service residential landscaping services in Hertfordshire, our green waste and compost service can be a convenient part of your home's garden maintenance. To find out more about our services, give us a call now! Ricky Tyler Landscapes can provide gardening and grounds maintenance services including Green Waste and Compost covering London, Essex, Hertfordshire, Northampton, Buckinginghamshire & Bedfordshire .